Netflix Original Documentaries’ and Time Inc.’s The Mars Generation is the definitive look at mankind’s future journey to Mars, as told through the eyes of the teens who will be the first ever to set foot on the Red Planet, as well as the leading experts currently pushing the boundaries of technology and innovation in space exploration. The film follows a group of trainees, ages 15-18, at the U.S. Space & Rocket Center as they prepare to become the engineers, astrophysicists and astronauts of tomorrow. The audience will also get an inside look into the architecture of the modern space race from the perspectives of the public and private sectors. We will also witness the ways that the teenagers’ progression to become the next generation of space experts mirrors the development of today’s space leaders, and prepares them for mankind’s most challenging expedition yet. The Mars Generation provides insight into the historical, philosophical, and technological implications of becoming a multi-planetary species and reveals that Mars is closer than you think. 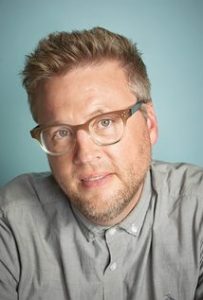 Michael Barnett is an Emmy-Award winning filmmaker with a history of telling inspiring, inquisitive, and captivating stories. Michael’s first film, the Emmy-nominated HBO documentary “Superheroes” is a chronicle of the real life superhero community. In 2012, Michael created the production company SuperFilms! and Executive Produced Sundance Selects & IFC’s “Gore Vidal: The United States of Amnesia,” which premiered at the Tribeca Film Festival. In 2016, Michael partnered with Morgan Spurlock for his next film, Showtime’s “Becoming Bulletproof,” an intimate story of a group of filmmakers living with disability which went on to win over 25 Best Doc/Grand Jury/Audience Award prizes. Michael’s latest film “The Mars Generation” is a Netflix Original Documentary, premiering spring 2017, and was selected as one of the opening night films at the 2017 Sundance Film Festival.